"Oans & Zwoa & Drei & Gsuffa!" The official toast of Oktoberfest. This refrain is heard in beer gardens throughout Bavaria and roughly translates to "One, Two, Three, Chug!" Many believe that Gsuffa means merely to "drink" but no, it means "drink down" or "chug it baby." 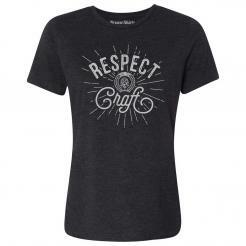 Printed in environmentally friendly water-based ink for a super soft feel on a soft 100% ringspun cotton t-shirt.